One of CoolSculpting’s best providers is found in Columbus, Ohio. Dr. Mary Beth Mudd was the first physician to introduce CoolSculpting® to Ohio and has the most knowledge and experience in using the therapy to permanently freeze your fat cells away. CoolSculpting® uses a fat cell’s own construction against it. Fat loses energy faster than surrounding skin cells. Exposure to cooling draws off the heat that the fat cell needs to live. Lipids in fat cells crystallize at warmer temperatures than other water containing cells. This way, only fat cells are targeted for destruction, while skin, muscle, and nerve cells aren’t bothered. These frozen fat cells are gradually digested in the 3-4 months after the procedure, and are eliminated in much the same way your body normally eliminates fat from food. The overall result is a reduction in the thickness of the fat layer that’s treated. If you are interested in learning more about what CoolSculpting® can do for you, call 614-888-6833 today to schedule an appointment. During the procedure, a non-invasive gel pad is applied to the surface of the skin in the area where fat is to be treated. 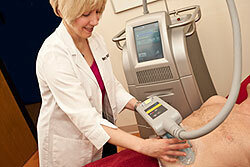 A non-invasive applicator draws the fat tissue into a vacuum cup and delivers the controlled cooling. Initially you’ll experience some squeezing, tingling and some “cold stinging” as your body adjusts to the drop in temperature, but after about 5-10 minutes most people just report numbness. A constant sensation of “pulling” or suction is sometimes felt. To keep the applicator in place, you will not be able to make sudden motions or significant changes in position. So be ready to sit still. You can take the time to read, listen to music, use the computer, or what many patients do…take a nap! Is my fat gone for good? CoolSculpting® permanently destroys the fat cells in the treated area. The eliminated fat cells cannot grow back. However, remaining fat cells can grow larger if more calories are taken in than are burned up through daily activities and exercise. Does Zeltiq CoolSculpting® improve loose skin? CoolSculpting® works only on fat and does not work to improve loose skin. Therefore, if you are worried about loose skin and have tummy fat, it may be better to consider LaserLipo as the permanent fat reduction method, since LaserLipo also improves skin tightness. Is Zeltiq CoolSculpting® right for me? That’s really impossible to tell without a consultation in person with the doctor. Generally speaking, CoolSculpting® is appropriate for fat elimination if you are within 10-30 lbs. of your ideal body weight and your skin is firm and tight. Look at the RealSelf review about CoolSculpting® above to get an insight by someone who has had the procedure. If you’re not exactly in this zone but are still interested in the procedure, perhaps because of a medical condition, then listen to what we say about realistic expectations for results. Keep in mind, at the New You Center we’re here to help you find solutions to your bodysculpting problems, not just sell you a therapy because we have a machine. That’s not how we work because that’s not good medicine. All bodysculpting is a medical procedure requiring a physician diagnosis. You wouldn’t just go buy a new hear procedure you saw on the news based on price and what you read on a medical website now would you? Unfortunately there are providers out there more than willing to sell you a procedure to make a buck. As a physician my job is to help you make informed decisions. I’ll be honest about the results you can expect with whatever procedure you decide upon. I want you to consider your options, even if that means sending you to another physician to get the results you want. They are very different, especially since CoolSculpting® actually creates permanent loss of fat cells, while Zerona causes a temporary decrease in the size of fat cells! CoolSculpting® uses cryolipolysis (fat freezing) to permanently destroy the fat cells in the treated area. About 25% of the fat layer has been demonstrated to be removed with a single treatment, although it is possible to have additional treatments if you desire more fat to be permanently eliminated. Zerona uses low level laser beams to place a temporary opening in fat cells to “leak out” some of the stored fat and thereby shrink the cell. The cell is still intact and has the potential to get larger again by storing fat if more calories are consumed than are burned up during the course of a day. Therefore, it is possible to lose and regain fat repetitively in the same area over time since the fat cells are never permanently removed. Generally a minimum of 6 Zerona sessions are recommended, and it is possible to repeat sessions if the fat is regained. Zerona states it uses a “cold laser” since the patient does not perceive heat (which is generally felt when a laser is used), but this should not be confused with Cool Sculpting®, which actually uses controlled cooling to permanently destroy fat. Patients experienced significant levels of discomfort compared with CoolSculpting® and Laser Lipo/SmartLipo®. Either procedure is the “right choice” depending on your circumstances and your goals. Choice is good! What parts of my body can I use CoolSculpting on? 1.) “The Safety and Efficacy of Cryolipolysis: A Systematic Review of Available Literature.”Derrick CD, Shridharani SM, Broyles JM.Aesthet Surg J. 2015 Sep;35(7):830-6. 2.) “Cryolipolysis for subcutaneous fat layer reduction.”Avram MM, Harry RS.Lasers Surg Med. 2009 Dec;41(10):703-8. 4.) “The efficacy of cryolipolysis treatment on arms and inner thighs.”Wanitphakdeedecha R, Sathaworawong A, Manuskiatti W.Lasers Med Sci. 2015 Nov;30(8):2165-9.